2 years is really not a long time in the general scheme of things. 2 years is 1/3 of the time that I've been retired, a tenth of the time that Memo and I have been together, and a mere 1/27th of my life on Earth. Having lived these 2 years in a veritable paradise has been thrilling. The move to Mexico was well worth doing. The people, the food, the cost of living, the scenery, and the endless opportunities to enjoy living make Ajijic, Jalisco, Mexico a winter weary waif's wonderland. 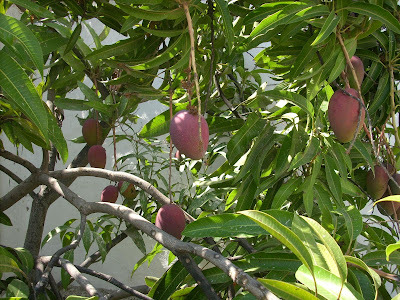 The mango tree is bearing a great deal of fruit. It's branches are sagging under the weight of all those mangoes. I enjoyed one of our mangoes with vanilla ice cream just the other day. Oh, how very very good it was. The picture above was taken today. This is our tree!